Copenhagen Carnival is a cultural event being held every year at Fælledparken in Copenhagen. Copenhagen Carnival is a three-day music festival organized by the Fonden Copenhagen Carnival. Copenhagen Carnival is one of Copenhagen’s largest cultural events, with the three-day festival in Fælledparken and its impressive parade, every year offers a wide and varied selection of music and experiences. Copenhagen Carnival was expanded in 2009 with several new initiatives. Among others a club-oriented scene with a wide range of exciting names from home and abroad. Carnival was first held in 1982 with the theme “The street is the stage and you’re the entertainer”, the time of unification “Carnival in May” (KIM). The event was later taken over by the National Association Carnival in Copenhagen (KIK), which organized the carnival until 2007. Carnival in May was started by the resident British artist John Little in 1981. He had experienced carnival in the Caribbean and was impressed by the joy and imagination it expressed. In Denmark John started Carnival in May, (KIM) as the group was called, got a small office in Krystal gade to raise money, do PR and start local groups that were trained in samba by Simba, a carnival dancer. PR effort included the small local parades, such as the football game in the Sports Park and around the streets and a compilation of press. The PR group expected 200,000 participants to carnival in Fælledparken in 1982, and it made all the headlines. Since the weather was good the carnival was a huge success. Aside from cleaning up which ended up costing the city a fortune due to the many broken bottles that had been used to beat rhythm with. The following year was purchased large quantities of cheap rhythm instruments in Brazil, which the inner circle of the Carnival Committee had sponsored tickets for inspiration, take pictures, make movies and shopping together with magasin and the Brazilian airline VARIG who flew the purchases to Denmark for free. The carnival got an explovsive growth and this culminated in 1986 when around two million people, according to police and newspapers, visited Strøget and the inner city. In 1994 new people took over and and formed the National Association KIK (Carnival in Copenhagen), which was an umbrella organization of the samba schools, carnival groups, stage bands, entertainer troupes and other groups and associations that deal with popular culture in Denmark. The National Association Carnival in Copenhagen, however, had difficulty in making the ends meet and had to close down in 2008. Long it seemed that there would not be be organized carnival in 2008, but the Copenhagen samba schools entered into a collaboration and hired a professional management, with Morten Sørensen in the front, to run the carnival. This decision proved to be vital for Copenhagen carnival. For the first time in several years the carnival came out with a surplus, despite the new leadership having had less than two months to get everything in place. The great result created optimism in the carnival environment and to ensure continuity in the organization of the annual carnival in Copenhagen, they decided to create Fonden Copenhagen Carnival. Fonden Copenhagen Carnival is also working to publicize the music and culture from all countries of the world through various musical and cultural events – but with special focus on Brazil and samba. Children’s Carnival is also in Fælledparken with workshops, play areas etc. Saturday and Sunday until, at 18:00. Friday is the institution carnival with workshops and children’s performances on stage. 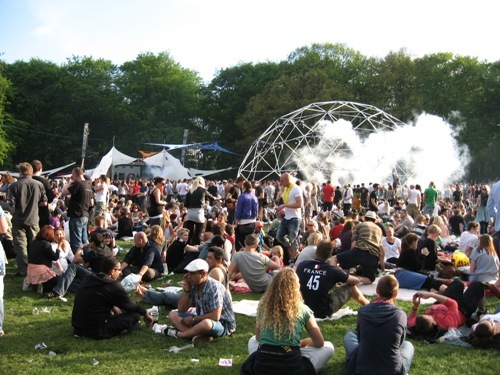 Over time the carnival evolved to be Denmark’s biggest festival of world music. More than 100 orchestras, groups and artists each year make a contribute to the festivities. The event is free for all, and you can experience music from a variety of scenes in Fælledparken. This is an event you should absolutely not miss. Whether you are into music or not -it’s a perfect opportunity to meet with your friends in the park and just have a fun day out. NB: Information about the carnival was found on Wikipedia and the picture above is from the electronic scene in Fælledparken.